Location: Near Coatzalcolcos and Acayucan,Mexico. Grid Reference: 19° 26.60' N, 99° 5.60' W.
Early Olmec culture had emerged centred around the San Lorenzo Tenochtitlán site near the coast in southeast Veracruz. They were the first Mesoamerican civilization and laid many of the foundations for the civilizations that followed. Among other "firsts", there is evidence that the Olmec practiced ritual bloodletting and played the Mesoamerican ballgame, hallmarks of nearly all subsequent Mesoamerican societies. 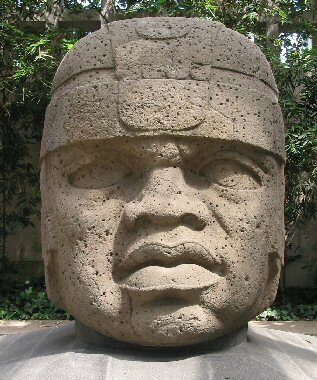 San Lorenzo is best known today for the colossal Olmec stone heads unearthed there, the greatest of which weighs onwards of 40 tons (3) and is 3 metres high. Until the early 1900's, the Maya civilization was considered to be the parent culture in Mesoamerica from which all other societies sprouted. There have been many Mayan sculptures and carvings found in the region, so all other carvings were also considered to be that of the Maya. 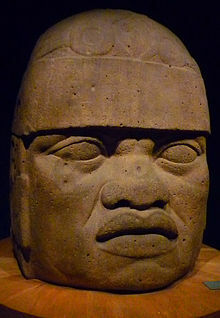 One difference in the carving is that some carvings of large heads had faces with more African looking features than many of the other Mayan works. There was also evidence of a half-jaguar half-man beast, which also did not fit in with other Mayan finds. It wasn't until 1929, when Marshall H Saville, the Director of the Museum of American Indian in New York, classified these new works as an entirely new culture not of Mayan heritage. He named this culture Olmec, which means the "rubber people." San Lorenzo was the largest city in Mesoamerica from roughly 1,200 B.C. to 900 B.C. at which time it had begun to be overtaken by the Olmec centre of La Venta. By 800 BCE, there was little or no population, although there was an important re-colonisation of the San Lorenzo plateau from 600 to 400 BCE and again from c. 800 to 1,000 B.C. San Lorenzo seems to have been largely a ceremonial site, a town without city walls, centred in the midst of a widespread medium-to-large agricultural population. The ceremonial centre and attendant buildings could have housed 5,500 while the entire area, including hinterlands, could have reached 13,000. A royal processional aligned to the north-south axis of the plateau led the way to the centre. At the centre of the site are two palaces: the San Lorenzo Red Palace and the Stirling Acropolis. The Red Palace was a royal residence with a platform substructure, red floors, basalt roof support, steps and drain. The Stirling Acropolis may have been the sacred residence, and is surrounded by a pyramid, E-group and a ball-court. The Giant Stone Heads: An African Presence? 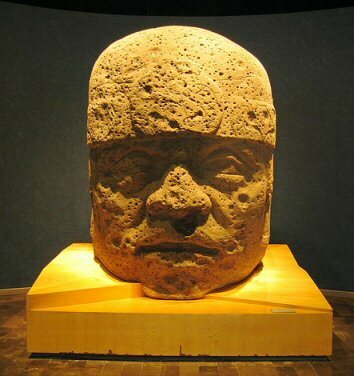 Colossal Head 1 now located at Museo de Antropología de Xalapa in Xalapa, Veracruz. This head dates from 1,200 to 900 B.C. and is 2.9 metres high and 2.1 metres wide. Two more heads from San Lorenzo. 1). J.E. Clark, "Gulf Lowlands: South Region", in Archaeology of Ancient Mexico and Central America: an Encyclopedia, 2000. 2). A. Cyphers. "From Stone to Symbols: Olmec Art in Social Context at San Lorenzo Tenochtitlán", in Social Patterns in Pre-Classic Mesoamerica. 1999. Dumbarton Oaks. 3). Ivan Van Sertima, African presence in Early America, 1992, Transaction Publishers.